This week the U.S. Department of Energy announced that America has seen the largest decline in demand for refined petroleum products since 1997. In fact, as a nation we have reduced our demand for gasoline every year since 2007, and by 2.5% last year alone – a reversal of a growth trend for the first time since World War II. Yet, at the very same time, we also learn gasoline prices are at their highest point ever for this time of year. What is happening, and why? The run-up in gas prices has occurred only since mid-December, as evidenced by the graphic below that shows the latest CME/NYMEX Wall Street gasoline contract. As all energy prices begin at the commodity markets, this shows that something has been driving up gasoline prices [and crude oil] since mid-December. 1. Our First Problem – Look at Government Monetary Policy. We have pointed out since 2010 that governments’ role in debasing the value of their currencies, especially in the US with the dollar, has the effect of driving the financial services community to look for ways to hedge against the decline in the value of the dollar by plowing billions into investing in commodities. These investment banks, hedge funds and similar financial services entities and the majority of those for whom billions in commodities are invested have no intention of taking delivery of the paper they’re investing in – they’re merely hedging the decline of the value of their dollars by investing in commodities whose value is rising. Both the US Federal Reserve and the European Central Bank [ECB] have engaged in and are continuing to pursue inflationary monetary policies that artificially inflate commodity asset values and drive up the cost of food and energy. This is a particularly difficult problem in Europe as refiners use European Brent crude as the benchmark for crude acquisition costs. As the ECB deals with collapsing economies in Italy, Portugal, Greece, Ireland and elsewhere in the EU through inflating the EU economies, this has the tangential effect of inflating energy and agricultural commodity prices. Much of what the ECB has done, with our US Federal Reserve, to stem the collapse of our own economy as well as Greece and other EU economies has been done since late last fall. Hence, one major contributor to the rise of gasoline prices since December. As the world central banks have turned on the liquidity pumps to support the Eurozone and the U.S. economy; the most logical place for that excess liquidity to go is into highly liquid, highly leveraged, commodity contracts. The rising number, the second highest peak on record, of oil contracts outstanding continues to push prices higher. In turn those higher prices draw more speculation into the market – so forth and so on. The chart below illustrates this point. 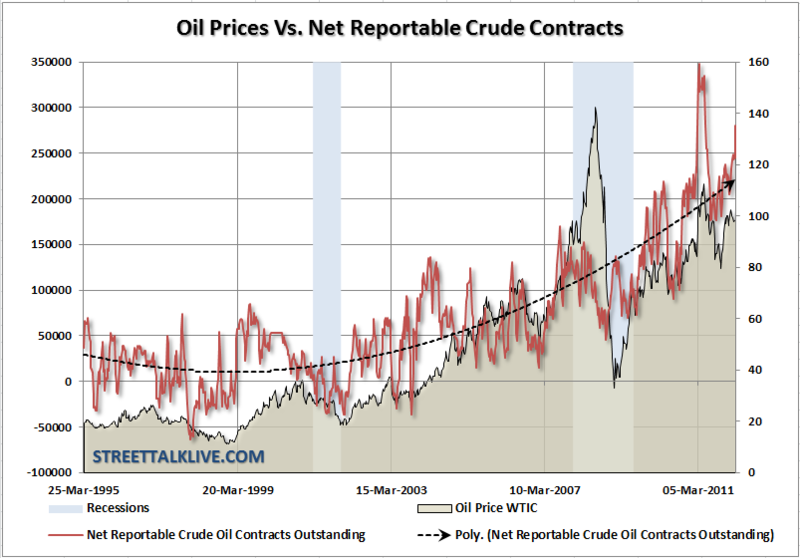 As the number of reportable crude oil contracts has risen, oil prices have risen commensurately. Note that much of the rise in crude contracts and crude prices has occurred since 2000. So, while the gasoline price increases we’ve seen since December, 2011 are recent we are in a longer-term trend that started in 2000. Look at various parts of the economy and inflation since the year 2000. The trend grew even more volatile with the onset of the world financial crisis in 2007 and since, as central banks have pumped trillions of dollars into failing economies in the US and Europe in an attempt to revive them, albeit artificially. Only college tuition costs have outpaced the cost of energy since 2000. In fact, energy costs have risen at 3 times the rate of the increase in the consumer price index since 2000 [CPI-34.3% versus energy at 110.6%] As long as the US Federal Reserve and European Central Bank continue to artificially inflate their economies by debasing the value of their currencies, we will continue to see agricultural and energy commodities’ values to also be artificially inflated. Defend the dollar, strengthen its value, and as energy commodities around the world are priced in dollars, the price of energy and agricultural commodities will decline. 2. Our Second Problem – Look at Commodity Market Regulation. The 2010 federal Dodd-Frank law contained powerful tools to enable the Commodities Futures Trading Commission [CFTC] to restrain the degree to which investment banks, hedge funds and the like may invest billions in commodities without ever intending to take the delivery of the commodities in which they are investing. This is also the area of regulation that is effected by every snort and grump that comes from the activities around the world that make commodity traders nervous and causes panic contract buying. Frankly, a federal law prohibiting commodity traders from watching the news might help here as well. Back to reality. The first effort of the CFTC was to have finalized a position limits rule,which is a regulation limiting the degree to which those who have no intention of taking delivery of the commodities in which they are investing, may invest in those commodities. This rule, finalized late in 2011, is now the subject of a federal District Court lawsuit filed by two associations of the financial services industry, seeking a stay. The position limits rule needs to be implemented and strengthened to limit the effects of speculative investments, by those with no intention of taking delivery of what they invest in, in commodities and the artificial inflation in the cost of the 28 agricultural and energy commodities that are the object of the rule. Second, the SEC and CFTC have both issued their proposed “Volker Rule” restrictions. The financial services industry needs to be restricted in their proprietary trading practices such that they cannot use the FDIC-backed funds they hold or funds accessed from privileges by borrowing at the Fed for speculative adventures, much of which is in commodities both as paper as well as physical investments. There is no reasoned argument that the financial services industry should be allowed to take advantage of taxpayer-backed funds for speculative investments. Glass-Steagall prohibited these practices by law from 1933 until it was repealed in 2000 [remember why 2000 was important, see above]. Energy commodities need to become 100% deliverable, which is to say that the inflated paper values that are used as asset investments need to become physical commodity transactions where each purchaser is involved in a transaction that is 100% deliverable, backed by actual physical energy not simply a paper transaction. 3. Our Third Problem – Look at Energy Policy. For the first time since Truman was President, the US has become a net exporter of petroleum. Stunning as that may be to hear, it is true. Between the decline in our economy and decreases in energy demand from that and enhancements in energy efficiency from better energy use in transportation to housing to manufacturing, coupled with increases in US domestic production of energy, the US is in a far better position on traditional energy than we have been in many decades. Just ten years ago the US exported 40 million gallons of refined petroleum [jet fuel, gasoline, diesel fuel, etc] per day and by the end of 2011 that was 117 million gallons per day. So what’s the problem? For every 3% of economic growth there is a 1% increase in energy demand. As our economy recovers, and that of the rest of the world, energy demand will increase and the US needs to do its part to contribute toward increasing world energy supply. That means building the nation’s ongoing, consistent and growing demand for physical energy by expanding domestic supply. Projects such as the Keystone pipeline adds physical crude to a marketplace and furthermore, moves US Bakken crude to the Gulf Coast in a pipeline instead of more expensive truck and rail. Bakken crude is heavily discounted off even the WTI quote, evidence average retail gasoline prices at 40-50 cents a gallon less than the national average in states such as Wyoming, Idaho, Colorado, Montana and Utah. Plentiful and less expensive US crude from the upper midwest and west needs to be more broadly used in a market that needs less expensive crude than the Brent benchmark. The US is in a world market for most of what touches consumers every day including agriculture, high technology, transportation as well as energy. The US cannot build a wall around itself or insulate itself from world events or the world economy. As the world consumes 86 million barrels a day of crude oil, the US needs to play its part to build additional domestic supply which adds to world supply, which acts to dampen crude prices. The United States already has extensive pipeline networks throughout the area of the Midwest where the proposed Keystone pipeline would be built. There is no excuse why in 2012 this project cannot be completed successfully and in an environmentally sound way. Yesterday the President mocked those who say “drill, drill, drill.” Well Mr. President, the US creates 25% of the world’s total economic output of goods and services. Doing that requires long term, consistent and reliable sources of affordable energy based on energy policies that don’t change week to week but remain intact for decades. There is no excuse why the US cannot manage to build a crude oil pipeline where there are already pipelines carrying energy of all types in the very same areas. These projects are not about today, but they are about planning for the future – something government does not do well. We need to demand better. Government is not helpless to act. Government can and should act and act now. Energy prices are crushing American consumers and whatever benefit may have come from a payroll tax cut have already been wiped out by the increase in just the cost of gasoline. Expand domestic production capacity and enact policies for the “All-Of-The-Above” energy strategies that begin with traditional energy as those sources will be with us for 100 years or more and starving the economy is no way to encourage economic growth, putting millions back to work or reducing energy prices. We need long-term, stable, reliable and consistent traditional energy supply and policy while government encourages the evolution of biofuels, wind, solar and other technologies. This entry was posted in Energy Prices, Energy Production and tagged commodity markets, gasoline prices, investing in commodities, refined petroleum products. Bookmark the permalink.